Panerai is the Official Watch of the 35th America’s Cup and of the Defenders, Oracle Team USA. The world’s oldest trophy sport in international sporting events, the America’s Cup is coming into full sail. 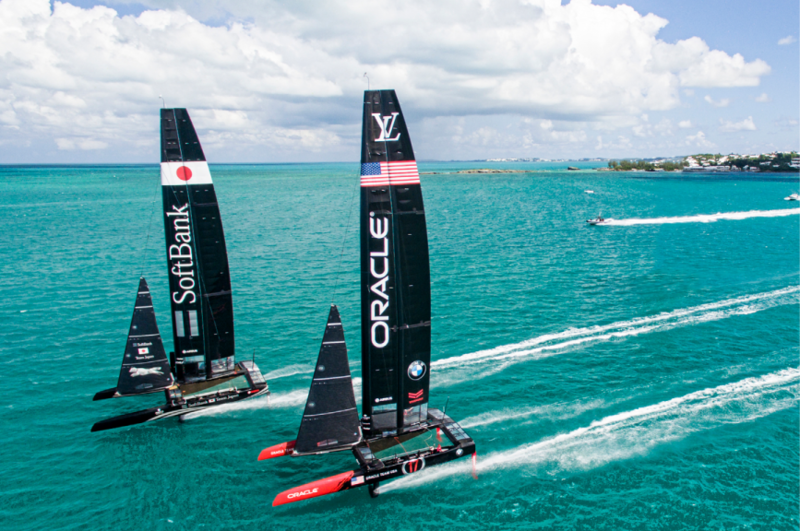 Beginning this Friday, May 26, in Bermuda, the qualifiers kick off of the 35th America’s Cup presented by Louis Vuitton. The competition for the oldest trophy in international sports dating back to 1851, witnesses America’s Oracle Team USA as the Defenders of the Cup (the team also won the 2013 America’s Cup races and the 2010 series before that). Swiss watch brand Panerai acts as the Official Watch of the 35th America’s Cup, as well as the official watch for the Defenders, Oracle Team USA. During the Qualifiers, five challengers will race one another determining placement for the upcoming Challengers Playoffs that will take place over the course of a month to determine the final challenging team that will come up against the Oracle Team USA in the America’s Cup in June, where the best of seven races takes the Cup. Qualifying races for the 35th America’s Cup begin this week. The high-precision boats being built and raced for this year’s event are spectacular in size and technology. The incredible foiling wing-sailed catamarans being raced in the turquoise waters are capable of speeds of between 50 and 100 km/hour, depending on the design and class of the boat. With their magnificent foiling abilities, the boats rise out of the water and seemingly glide across the ocean on air. It is one of the most dramatic and unusual feats to watch. In fact, these boats — typically designed by teams of more than a dozen experts and built by dozens of specialists — mark an entirely new era of yacht racing. Naturally, with manpower, high-tech materials and precision coming together in these races, it makes sense that among the sponsors and supporters of the teams, and the event itself, are a host of watch brands. Throughout the coming weeks, we will bring a close-up look at which brands play which roles as we get ready for the final count down to the Cup. 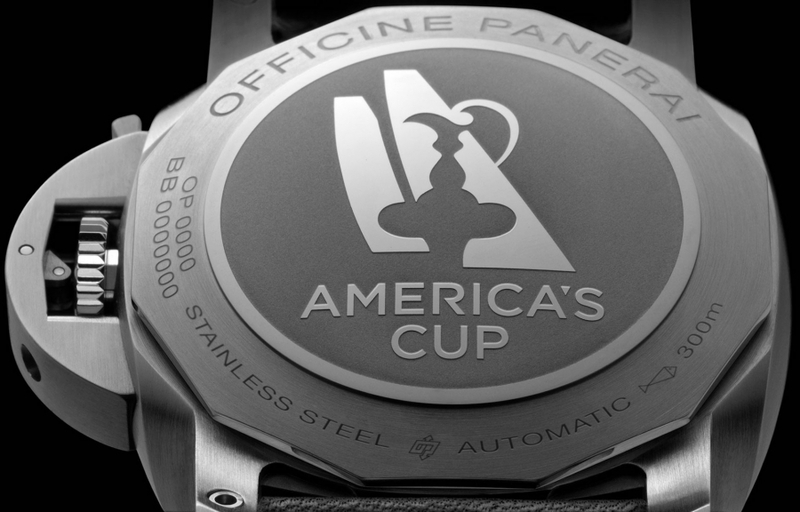 Officine Panerai is the Official Watch of the 35th America’s Cup. 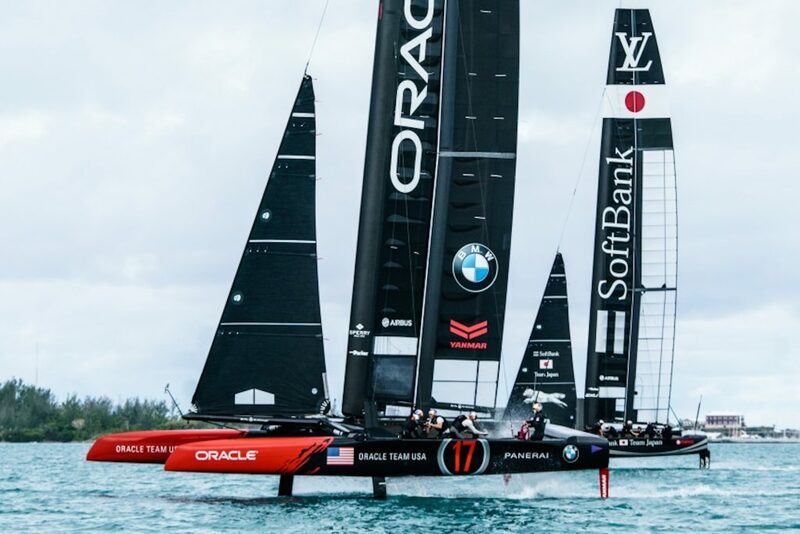 The brand is also the Official Watch of the Defenders: Oracle Team USA, skippered by Jimmy Spithill. “Essentially we are trying to fly a boat,” says Jimmy Spithill, Skipper and Helmsman of Oracle Team USA. “We have put a big effort into our control systems and our instrumentation.” Spithill also is a licensed pilot (both planes and helicopters), something he says helps with the foiling of the wingsail catamarans. Additionally, Panerai is the Official Watch of challenger Softbank Team Japan. With its leading role in the 35th America’s Cup, Panerai also unveils five powerhouse watches to celebrate the event, and the teams it supports. Top among them is the Official Watch of the America’s Cup, the Panerai Luminor Marina 1950 America’s Cup 3 Days Automatic Acciaio 44mm. It features Panerai’s patented crown protecting lever device and is water resistant to 300 meters. Crafted in stainless steel, the 44mm watch displays the words “America’s Cup” on blue on the dial, and the black leather strap with red and blue stitching to emulate the team’s colors is embossed with the America’s Cup logo. The watch is powered by the in-house-made automatic caliber P. 9010 movement with three days of power reserve. The caseback is also engraved with the America’s Cup logo. Just 300 are being made They retail for $8,100. There are three watches dedicated to Oracle Team USA. 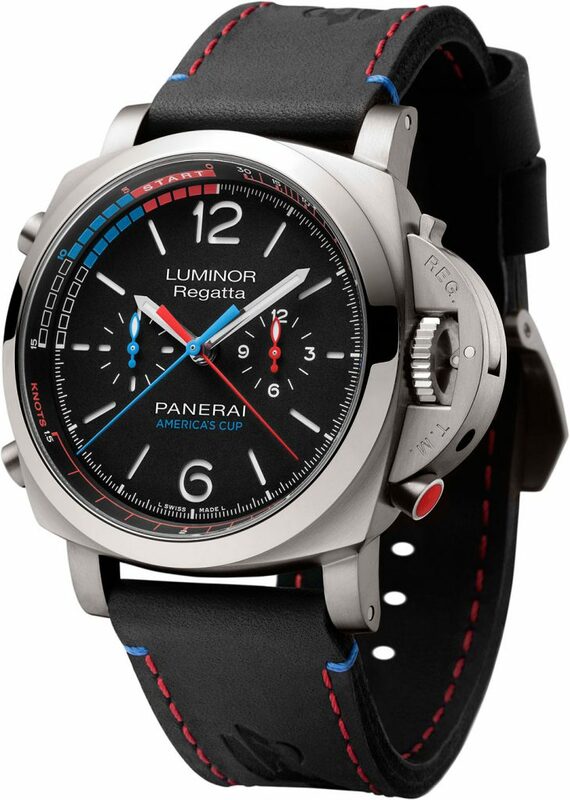 The Panerai Luminor 1950 Oracle Team USA 3 Days Chrono Flyback Automatic Ceramica, 44mm is Spithill’s favorite. Equipped with a flyback chronograph function, 44mm case of this watch is made of black ceramic with a titanium caseback engraved with the Oracle Team USA logo and the words “35th America’s Cup.” Water resistant to 100 meters, it is powered by the caliber P.9100 with column-wheel chronograph. The flyback function is operated via the pusher at 8:00, and the watch features a tachymeter scale to measure speed in knots. Just 200 pieces will be made at $15,300 retail. 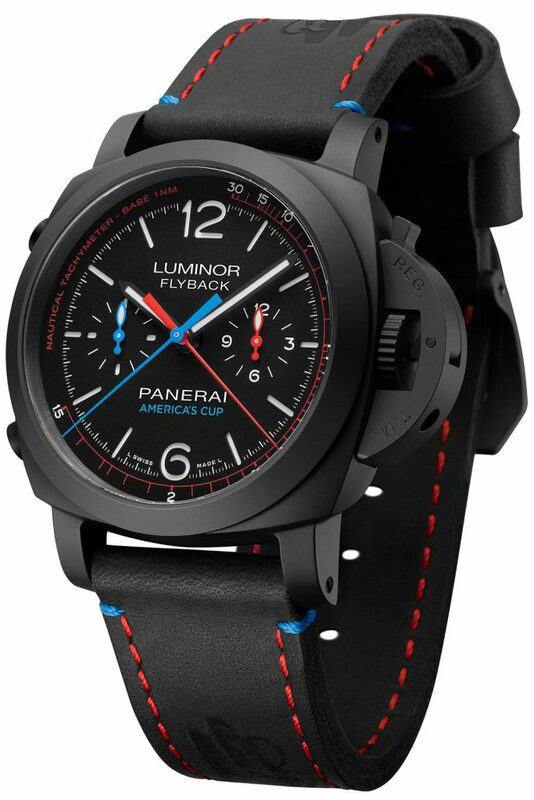 The Panerai Luminor 1950 Regatta Oracle Team USA 3 Days Chrono Flyback Automatic Titanio, 47mm watch embraces the true spirit of the America’s Cup races thanks to its regatta countdown functions. Crafted in titanium, the 47mm watch uses the P.9100/R movement, which is the automatic flyback chronograph caliber with a module added for the countdown function. It also features Oracle Team USA’s logo and has an image of the boat engraved on it. Just 200 pieces will be made, each retailing for $17,900. The caseback of the Panerai America’s Cup watches are engraved. The most affordable of the three Oralcle Team USA watches is the $7,100 Luminor Marina Oracle Team USA 8 Days Acciaio, 44mm watch. The 44mm stainless steel watch offers eight days of power reserve and is powered by the manually wound P. 5000 caliber. With patented crown protector, it is water resistant to 300 meters, and is made n a limited edition of 200 pieces. 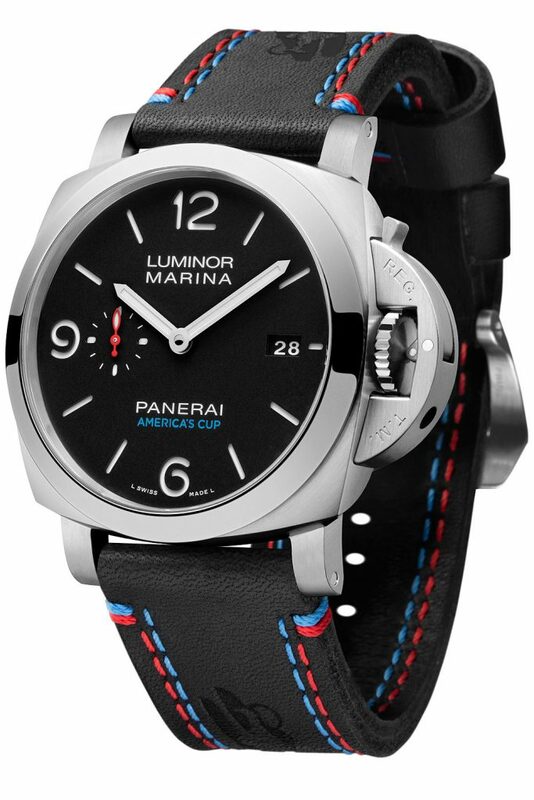 Honoring Softbank Team Japan, is the Panerai Luminor Marina 1950 Softbank Team Japan 3 Days Automatic Acciaio, 44mm watch. Powered by the P.9010 movement with three days of power reserve the watch caseback shows Team Japan’s logo and an engraving of the team’s boat. The black strap features red and white stitching in honor of the Japanese flag. Just 150 pieces will be made with each retailing for $8,100.